DIY craft ideas for you, today! Follow us on our Social Media! I don’t know about you, but I could always use a little more help with organization, especially if it came in the form of these incredibly nifty, space-saving little hanging baskets! If you crochet them using a strong cotton, they’ll not only be durable, but washable as well! 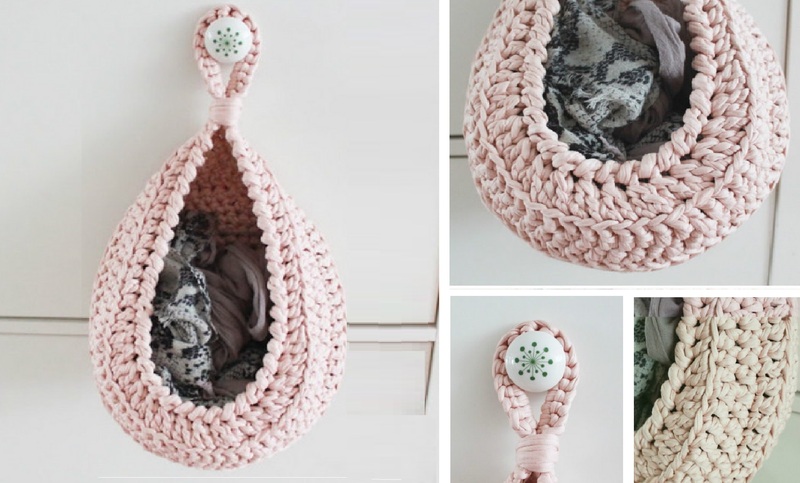 Wooly Wonders Crochet has an excellent YouTube tutorial for the Very Easy Hanging Basket using an 8mm crochet hook. It’s worked in the round from the bottom up, all in one piece. Simple, and sufficient to store a wide range of items from the kitchen, bathroom or bedroom. The Crochet Diaries (Summer Brodbeck) has a free hanging basket pattern available on Ravelry, using a worsted weight yarn and a 6mm crochet hook. There’s also a formula to use if you want to make bigger or smaller baskets for a matched set of storage containers. Dweller In A Little Hollow’s pattern for the Infamous Hanging Basket is the English version of a Norwegian pattern that circulated on Pinterest for months with little to no luck finding a comparable pattern written in English. It’s also available in Spanish. You can use whatever yarn and crochet hook size you like, provided the gauge is tight enough for what you’re wanting to store. All of these baskets would make lovely little additions to your organizational arsenal, or as a great moving in present for a friend. Whatever their use, they’re quick to whip up and place around the house to ensure the mess disappears! If you’re interested in any of the above patterns or crocheters, you can find them at the following websites: Wooly Wonders, The Crochet Diaries, Soul Made, and Dweller In A Little Hollow.